Dear friends of the unreal! Submitted for your consideration : Art that is public official and institutionally validated. Art that is private, personal, and unauthorized. And then the war – the terrifying pictures of Otto Dix: so horrifyingly grotesque that the museum visitors (many of whom were German) dashed by the massive wall where the black and white drawings of the dying and the terrified are stacked on top of each other like a PTSD mosaic. 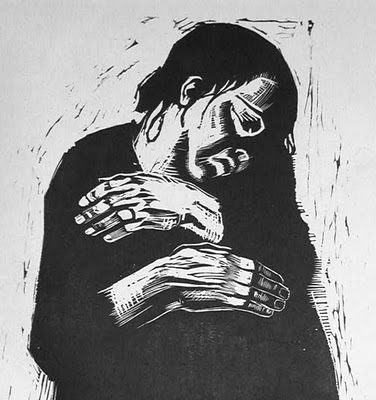 But you could not rush by Käthe Kollwitz. Her woodcut series WAR presents huddles of figures – black relieved only by the occasional line, the occasional circle indicating the white of the eye. She shows us the true combatants: parents, children. “Mothers” shows us densely packed women, embracing while looking with fearful determination in every possible direction, while one child peeks out, alert and searching from beneath the arms of his/her collective maternal circle. The drastic simplicity of the woodcut — its roughness, its blockiness — enables us to see what we can’t access in photographs, life footage or news reports. Käthe Kollwitz– you belong to “us” too – the art makers and lovers of THIS century. Welcome. German – who is neither nationally nor ethnically German – has some made horrid little offerings: fish swim over a beaded map towards the Devil’s Triangle of Madoff’s Manhattan, while in other pieces, abstract and skeletal skyscraper architectures loom over shadow-silhouette-ghosts. What is that brickwork on the buildings? Dollar bills? Stock holdings? 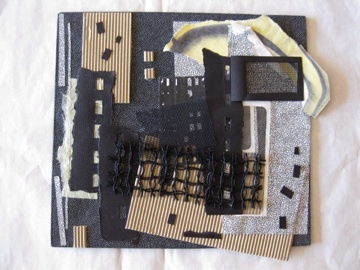 Her shadow-box collages – many with lids – suggest the ways in which we compartmentalize suffering, miniaturize it, and hide it away. But the poisonous packages look like presents and consequently MUST be opened. When we do open them, we see ourselves in those indistinct shadows, recognize our foreclosures in the burnt out buildings: the (Sub)urban wreck of our “holdings”. For this reason, the boxes are oddly comforting: the landscape of the Great Recession proves to be not “great” at all; it’s tiny, and somehow the disaster is reduced to a more manageable size. We can literally take German’s boxes in our hands, and thereby get a hold on what has happened to us. Maybe. If, we can learn from our mistakes. Idee German belongs to” us” too : an inheritor of the European avant-garde, she connects with the grotesquerie of German Expressionism, but adds her contemporary New York Jewish girl sense of the ridiculous and the awareness of the subversive power of the small. Kollwitz would get German’s work. Danke schön, ladies, for keeping it unreal. Next ›HAPPY BIRTHDAY FRIDA KAHLO!